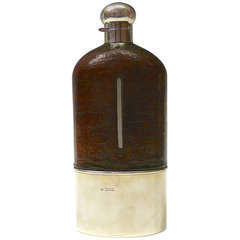 A very large pigskin leather and silver plate covered glass hip flask by James Dixon & Sons, circa 1910. Dimensions: 28 cm/11 inches (height) x 11.5 cm/4½ inches (width). Bentleys are Members of LAPADA, the London and Provincial Antique Dealers Association. All prices are net of VAT for export outside the EU.